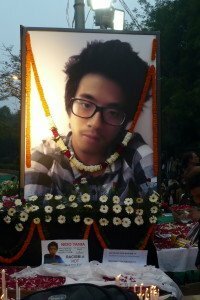 A couple of weeks ago, Nido Tania, a teenager from Arunachal Pradesh, one of India’s most beautiful and most remote states, was attacked in Delhi, beaten up and died as a result of his injuries. 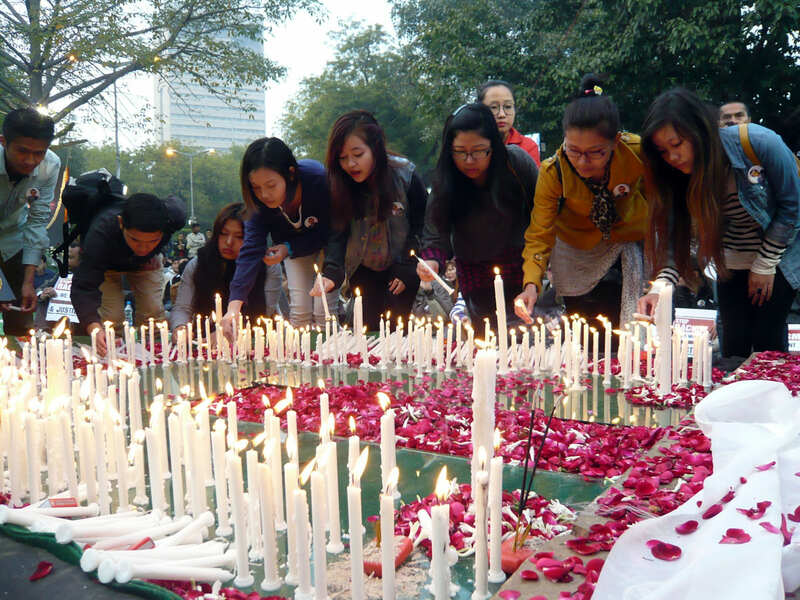 I blogged about it at the time, when I had gone to a candle-lit vigil in his memory at Jantar Mantar with my friend Catriona. If you didn’t read my post then, have a quick look now, along with the photos of the dignified mourners. Yesterday, Catriona went to the prayer meeting held for this young man, and she has written a very moving report of the evening, as a guest blogger. Nido Tania’s elfin face is a haunting image – his youth, big glasses, vulnerability and funky Korean hairstyle a shocking contrast to the brutal manner of his death in Lajpat Nagar just 10 minutes’ walk from where I live. Reproduced over and over, as the shameful story took its roller-coaster path through the media, that image has not lost its power. Tears prickled unbidden as it greeted me on arrival at a multi-faith meeting arranged by Nido Tania’s grieving family and friends at Jantar Mantar on Saturday (15 Feb). Just over a week ago, when Christine and I attended a vigil for Tania (Nido was actually his surname) at the same location, we had to pass several dharnas for different causes before reaching the spot. On Saturday there were no other protests; the Arunachal Pradesh Chief Minister was attending the meeting and security was tight. A large crowd, mostly north-easterners, but also people from other communities, sat quietly. Images of Tania were everywhere, with short hair, with long hair, with brown hair, with blonde hair, alone or with friends, pensive or laughing. Dignified, serious and beautiful, the occasion did the north-east community and India as a whole proud, reminding us that gold still lurks among the grunge, even if you have to look for it. Well-delivered messages from the platform were powerful but not strident, conveying deep currents of emotion without a trace of hysteria. Religious leaders of the most prominent faiths of India – Buddhism, Christianity, Hindu, Islam and Sikhism – prayed for Tania’s soul and for tolerance. Deep chanting by Tibetan monks, who’d come all the way from Dharamsala, made our very cells vibrate. A sweet-voiced Tangkhul Naga choir filled the cold evening air with pure, clear notes. But the night belonged to Tania’s mother, one of the extraordinary women that the sub-continent produces despite all the barriers of patriarchy and chauvinism. 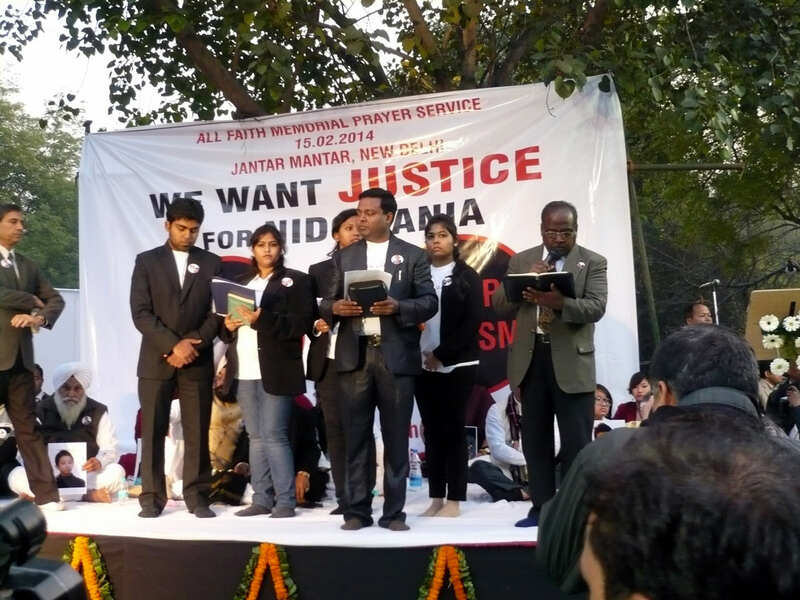 Brave beyond belief, she spoke at the end of the event, mourning her son, then pledging to honour his memory by tackling the scourge of racism, not only for north-east students but for all castes and creeds in multi-cultural India. And her efforts have already borne fruit. There is to be a CBI investigation into Tania’s death and steps are to be taken to include information about the north-east in the syllabus of schools under all State boards and Central Boards including CBSE. 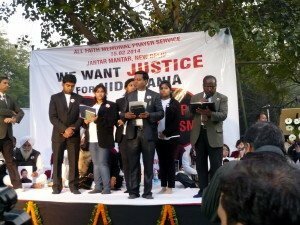 But it won’t stop there, Tania’s mother has much bigger goals in her sights: an Anti-Racism Act, one-time recruitment of 5000 Delhi police personnel from north-east states, a special police station dedicated to cases of racial discrimination and atrocities on NE people and much more. Fuelled by grief and anger, and armed with formidable competence, this woman from the remote and hilly state of Arunachal Pradesh will move mountains in the name of the son she lost in Lajpat Nagar on that fateful day. India is a country where, to turn ones head is a common strategy for surviving the horrors of everyday life. Just to bear witness becomes intolerable. With age I have become pessimistic. Reluctantly, I leave optimism to the generations to come! Sad!